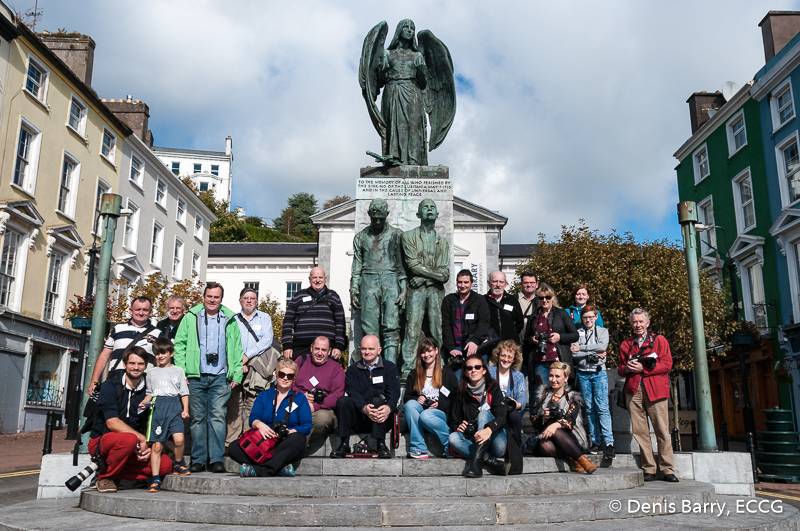 Brilliant sunshine greeted us outside the Commodore Hotel in Westbourne Place, Cobh, Co. Cork as we met at 11am to begin our 2016 Scott Kelby World Wide Photo Walk. This was ECCG's third WWPW having held the previous two in Midleton and Youghal in 2014 and 2015 respectively. Guided by local man Gordon Kinsella who knew all the best shots in the town, we began our walk in the park and then took a circular route taking in most of the town centre as well as Deep Water Quay. The roof-top of the Commodore Hotel, with its stunning views of the town and harbour, provided a fitting end to this most enjoyable event which we topped off with great food and conversation in the Hotel bar. As much a social event as a photography event, it was great to meet some new people and catch up with some that we haven't seen in a while. Thanks to Gordon Kinsella, the Commodore Hotel, everyone who joined us on the walk and everyone we met along the way. Check out the gallery from the event here but check back regularly as the gallery will be added to over the next week or so. Enjoy! This entry was posted in Activities, Events, Shoots and tagged Cobh, Commodore Hotel, East Cork Camera Group, ECCG, Scott Kelby, World Wide Photowalk by Denis Barry. Bookmark the permalink.